Located Rue de Tournon in the 6th district of Paris, this cut stone listed building had famous celebrities as guests and owners, including the renowned French writer, Honoré de Balzac. Balzac lived here from 1827 until 1830, staying at his friend’s, Henri de Latouche, a journalist/writer/poet who briefly managed Le Figaro newspaper. Balzac’s masterpieces, including Les Chouans and La Comédie Humaine, were written during that period. Poet Victor de Laprade, who followed Alfred de Musset at the Académie Française, also lived in this splendid townhouse. And so did mathematician and philosopher Antoine-Augustin Cournot: a commemorative plaque in honor of Cournot is located at the building’s entrance. This extraordinary apartment, on the second floor of the building, provides 248 sq m of living space and a 4-meter ceiling. “The building and the apartment were entirely renovated a few years ago, stresses Daniel Féau agency. 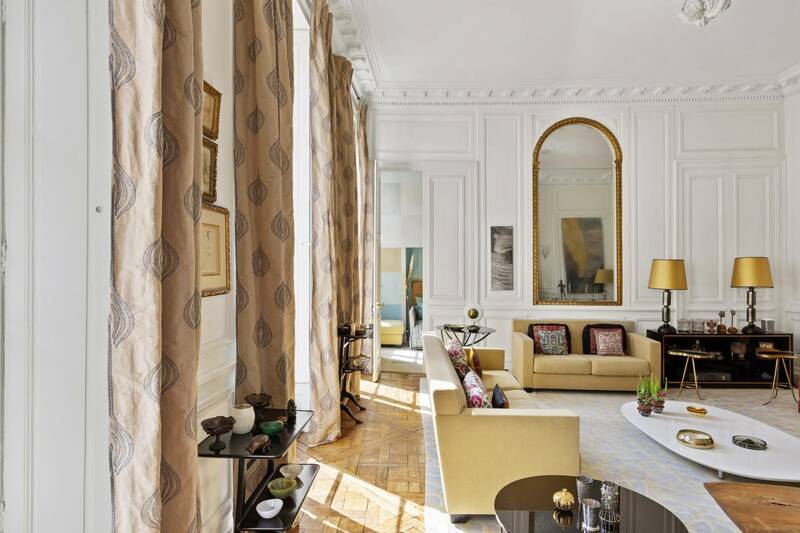 Its vintage preserved features include moldings, marble fireplaces, Versailles parquet. Those elements are highlighted by a contemporary decoration and furnitures made by her current owner, an interior designer.” East/West-facing, the property is bathed in light thanks to its large windows. Connected to a large entrance, the living room has three windows and three rounded mirrors, providing a sensation of space. The contemporary eat-in kitchen with its marble work surface and storage units connects to the dining room accommodating up to 12 guests. That room with its blue tones and its chandelier is adorned with vintage tiles. In all there are three bedrooms including a Master suite with its private bathroom. Designed to please fashion enthusiasts, the dressing is a true additional room in itself. A quiet study is also part of the property, located next to the living room. Other highlights include a detached studio and a parking space in the courtyard. The estate is located close to the most visited Parisian places including the Luxembourg gardens, the Senate and the St-Germain-des-Prés area.